My Better Day newsletter contains tips for your yoga practice, yoga quotes to bring yoga off the mat and into your life, affirmations to brighten your day and motivate, and more! It is my wish for your well-being that I send this newsletter to help make your day a Better Day! As a reminder, in response to my readers feedback, as well as my own 2012 Intention to spend less time glued to the computer, I have shortened the newsletter format by eliminating the Featured Deck and Quote section, and changing the timing of my newsletter to every two months versus every month. I continue to stock and sell one of my absolute favorite decks from local artist, Suzanne Vadnais Monson on my product page: http://betterdayyoga.com/products! In this issue: Yoga quote, Practice yoga pose, Meditation on the go, Chakrascope, Hand Mudra, Healthy News, Featured Recipe, Favorite Yoga Music / DVD, Happenings at Better Day Yoga LLC, Final Relaxation Quote. Growing up, my favorite magic portal was behind the big mirrored dresser in my bedroom. For a time, it was at an angle in the corner, creating a magical space behind the dresser to be out of sight, dream, doodle, pray, and just be. Id relish the awe-inspiring trinkets I had placed in a whimsical, Folgers coffee can. My can had a pink elephant on it and that touched my whimsy and made me smile (http://www.flickr.com/photos/neatocoolville/366368942/lightbox/). I cant remember what was in the can, but I will always remember that can! Entry into my magic corner was through the opening between the dresser where the seat usually stayed. When no one was looking, Id crawl underneath the large round mirror and let the magic begin! It was my own little world, my own corner, my own magic. Why do you think children like to make forts? Why do you think adults remember them fondly? Come on, secretly you still wish for that kind of place to retreat to, dont you? Perhaps youve already created one. Do we ever really grow up in the sense that we no longer desire feelings of awe? Are we ever really too old to wonder? We do not quit playing because we grow old; we grow old because we quit playing. ~ Oliver Wendell Holmes. Dont let an old person move into your body. ~ Jim Donovan. If you let go of the desire for awe, please excuse me as I let out a gasp of dismay for you. I guarantee you still feel a magical calling whenever your brand of whimsy presents itself. You may not know just why you enjoyed reading the Harry Potter series, or just why a trip to Disneyland still excites youalbeit for the kids, of course. What is it about the sparkles of firecrackers that turn even the sternest among us into a giggling child? Come ontheres at least one holiday tradition that you cant live without during the winter months, isnt there? Why is that? Its knowing your props, your triggers, that help you create your magic inside. Its still there you knowyour belief in magic. When was the last time you had a conversation with the moon? Or made a wish on a falling star? Held hope from a string of delicate things. When was the last time you got lost in an enchanted wood? ~ A Knock at the door by Angi Sullins and Silas Toball of Duirwaigh, Inc.
because it would be so very cool if they existed. Forget about what you currently deem possible to believe. Let that go for the moment. Can you at least admit how very cool it would be? First, let the idea of possibility inthen the magic will feel welcome to manifest. You may laugh at the mere mention of believing, but its in the believing that the magic is allowed to enter. Are you too old to believe? Do you believe magic is only for the young? I guess you get what you believe, then, dont you? Why is it so much easier to accept the concept of belief allowing creation to make itself manifest when its used in business? Why not simply be curious enough to know you dont know everything and believe anythings possible? It’s about a boy and his magic cape. What is your particular brand of magic? How easily do you open up to it? If you keep putting up walls to something energetically, it will stop trying to reach you. Release to it. Quit fighting it. Why not believe in magic? Why not believe wishes can be made on stars and fairies are always there when you look for them? There are those who believe that magic happens to the extent and in the form youll most accept. Sounds like a good tactic. What are you open to? Perhaps all you need are some props like you had as a child. What is a childs fort if not an adults ice house, tent, cabin, fishing boat, garden or meditation corner? Maybe the garden is your favorite place because you sense the quiet energy there, and it feeds your spirit. Maybe the workshop in the garage relaxes you because youre allowed to create whatever you want, whenever you want. Theres magic in energy, in creating, in being in a relaxed space where you are open to receive. 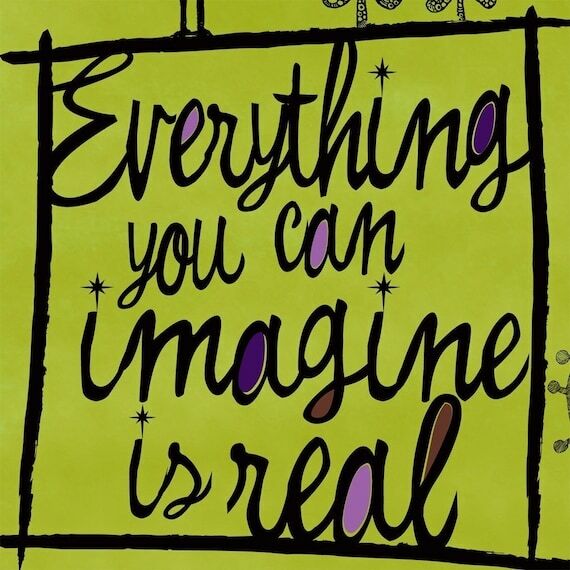 Theres magic in imagining. My husband and I make it a ritual to hug each morning on the carpet by the sink as the water brews for the coffee. I started calling it our magic carpet. Pretty soon, whenever I wanted to conjure up a magical moment, Id step on that magic carpet with an expectant gaze; and obligingly, my husband would provide the missing ingredienta hug. Theres absolutely no place else Id rather be. Before you start to smirk, may I counter by reminding you that my magic is mineand believe me, hugging my husband of almost 29 years with a romance that grows every single day is magic. Defining the carpet as our spot to let the magic in and release to it is our brand of magic. Whats yours? What can you use as your prop? Foolish, you say? Do you think we actually need the carpet to hug? Of course not! But do you think having the carpet as the instigator helps create the magic? The answer is a resounding yes! A batch of playfulness helps as well. Laughter attracts magic in countless ways. its a healing. Those that say its all in your mind like its a bad thing arent getting it. Are they? Yes! It is all in your mind! Your mind is where the healing begins! Your mind is also where the magic begins! only as long as you do not understand, is it a secret. And, indeed, do not all mysteries and miracles only appear so, in so far as we may not understand how they arise or occur? ~Yoga Nidra: A Meditative Practice for Deep Relaxation and Healing, by Richard Miller. All I have to do is look at it and know like I know like I know theres something magical waiting to make its presence known, one of these times, when I open that door. Theres magic in expecting. Attached to the fairy door is a note which reads: Im just a simple Fairy Door. No promises I make. But if in fact a Fairy comes, shell know this is her place. Inside it says Fair Door Enchantment Ideas: Hide small trinkets and treasures like a shell, feather, shiny stone or pennies in your Fairy Door to encourage Fairies and imagination. Fairy Doors are usually placed in an out of sight or secret place. Now, doesnt that describe to a T my magic portal behind the mirrored dresserright down to the trinkets and treasures? And doesnt that totally substantiate my suggestion to let the magic know when and where it is welcome? Meditate while sitting under trees around lakes, etc. Be cognizant of the abuses of nature and do your part to clean it up and reverence it. Involve yourself in some creative activity on a regular basis. You dont have to be an expert in it, but enjoyment of any creative activity will draw those of the faerie realm. Leave an area in your yard to grow wild so that the faeries can play freely. Be generous in your dealings with others. Keep the child in you alive. Ive also read that practicing meditation and yoga weekly, daily if you can, to boost your spirituality and enhance your mind is another way to prepare for the magic. Practicing outside so you can be one with nature is even better. To all unbelievers still reading, please re-read the list above. At the very least youll have spent time outside, added meditative moments to your life, created something you enjoy, added friends and spread smiles through your generosity, and giggled more than you used to. If that isnt creating magic in your own life, I dont know what is. So whats so bad about that? Still not sure what your particular brand of magic is? When was the last time you went some place for a couple of hours just to be there? THAT is your answer! And if you havent experienced wanting to go somewhere just to be there for a couple of hours, then perhaps try slowing your life down a bit once in awhile to let stillness in. If you do not believe in magic, your life will not be magical. Magic, like the power of Stonehenge, is part of the unknowablethat which you cannot describe, but which exists and makes your life extraordinary. The Power Deck, The Cards of Wisdom, by Lynn V. Andrews. although jurys out as to whether Im growing up. Think that fairy tales are for the naïve and foolish and not for intelligent people? You decide which type of adult you want to bethe kind that doesnt let the magic in, or the type that fosters it every chance they can get! Dont worry if youre already grown-up and didnt have the opportunity to indulge in fairy tales as a child. Theres still time! Look at your life through the eyes of the child you used to befull of wonder and curiosity and unscathed by preconceived notions. Daily routines and stress can squeeze the spontaneity right out of you. Keeping your nose to the grindstone and never looking up to notice the subtleties of life will choke your inner childs magic. Was there a movie, play, or song you enjoyed as a child that made you feel that anythingeven magicwas possible? Perhaps it was a place, or a costume. (For more on the magic of costumes and other outward props, take a peek at my October 20ll newsletter). Perhaps there’s a magical character you loved as a child? They’re still waiting! Revisit past joys. I cant watch The Lion King, Darby O Gill and the Little People, Miracle on 34th Street, Brigadoon, The Wizard of Oz, or Cinderella without letting the magic in; and I cant go for a swing in the park with eyes closed and not feel like the world is my oyster! Image Credit: Aimee Stewart of Duirwaigh, Inc. Since I opened with sharing my favorite magic portal as a child, I decided this was the perfect time to share my favorite magic portal as yoga teacher. Savasana is one of the most important poses in your yoga practice and it is often said that this is where the “magic” happens. This is the high point of your class where your body integrates all the work it’s done, integrating the healing benefits of your practice. We so rarely take the time to be still, yet our nervous system requires stillness to heal and to run efficiently. I mentioned earlier that being open to receive is the first step to allow magic into your life. Final Relaxation / Savasana is the ultimate time to “be open” to the magic. Yoga connects breath with movement, making it a moving meditation with the body. When you have completed your usual 60-75 minute Yoga class, and settle into final relaxation, your body is more ready for a total relaxation and more receptive to guided imagery and positive affirmations. Your body has been prepped to receive and is open to suggestion—open to the magic of healing. I typically offer a short meditation during final relaxation for this very reason, and end with a few minutes of total silence. Many of the meditations, affirmations, and guided imageries I use have been in my newsletters. We don’t need to go into the research here documenting the power of the mind to heal the body, but suffice to say when we don’t use the power of our minds to improve the health and well-being of our bodies, we are negating the best partner on our health team—ourselves. The August 2010 issue of Yoga Magazine had a great article on hypnosis http://www.yogamagazine.co.uk/. I remembered thinking at first, what does Yoga have to do with hypnosis? Then I remembered that Yoga is a somatic therapy using mind, body and breath. “Anything you do can be done better if you are relaxed. Sensory Awareness is the key to all Mind-Body methods. Mind-Body methods are practices that promote good health and enhance the quality of life.” The Mind-Body Connection, Linda-Christy Wiler, M.S. I can’t think of a better way to describe the benefits of Yoga. “Hypnosis is a natural state of heightened awareness where you are using more of your mind than you usually do. The average person uses about 10% of his brain at any present moment. Hypnosis lets us relax and use 100% of our mind to create habits, positive affirmations and change behaviors with the help of the subconscious mind.” http://hyp-yoga.com/index.html. Important note: Final relaxation pose should be at the end of both your hatha yoga practice and your pranayama/ breathwork practices. You should be in final relaxation at least five minutes for every hour of yoga practice. Never ever skimp on savasana! The circulatory system is unobstructed and delivers oxygen, nutrients and white blood-cells to where it is needed. These materials are the building blocks of healing. Helps to bring all of your chakras into balance and harmony. Alignment Cues: Prior to settling into the pose, it’s a good idea to cover yourself with a blanket and perhaps add some socks if you think you may get cold. Lie on your back, legs extended. Keep your neck and shoulders relaxed with the spine in one long, straight line. Turn your palms upward to the ceiling and allow the hands to move further away from the body than usual. Allow your feet to roll open. Let your breath relax and continue to release stress and tension in this pose, quieting the mind, relaxing completely, staying in the present moment. Let everything relax and let go. For lower back injury or discomfort, with feet on the floor, knees can be bent and “steepled in”, leaning against one another, if you don’t have a prop to put under the knees. Add a rolled blanket if neck is strained or other prop under the head for comfort. Make sure your ears are centered in between the shoulders evenly. Contraindicated for pregnancy: Raise your head and chest on a bolster or set of bolsters. Variation: (Face Down / Relaxed Crocodile) This variation was introduced to me as a good option for those who might be experiencing Post-Traumatic Stress Syndrome. The vulnerability of an open chest may be too much for some. This option would be offered as an “either / or” option. It’s not for everyone—especially if you are experiencing low back issues, and obviously if you are pregnant! Start by lying face-down on your belly, and slightly spread the legs with toes turned out. With elbows bent, rest your forehead on the backs of your wrists. Having your abdomen restricted by the floor, lets you play with breathwork using your chest, diaphragm and lower belly. You’ll more noticeably experience the rise and fall of your hips and lower back as your breath gently prompts the movement. * If students are laying belly-down on the floor, I always ask them to let me know if their neck is tight and they don’t want me to rock them. Spiritual aspects of final relaxation pose: As outlined in the opening paragraphs of this section, this pose promotes the healing magic of the mind through the use of affirmations, creative visualization, and guided imagery. Savasana takes us to the still point in ourselves, where we can reconnect with the sacred by encountering the endless possibilities that emanate from your center. Beth Shaw’s Yogafit®. The program for a more powerful, flexible, and defined physique, by Beth Shaw. Feeling stressed lately? Try Yoga Nidra! One of the many benefits of Yoga is reduced stress and a relaxed and clear mind. Read on as I highlight unique ways to use Yoga for stress relief and relaxation! The antidote to stress is relaxation. To relax is to rest deeply. This rest is different from sleep. Common to all stress reduction techniques is putting the body in a comfortable position, with gentle attention directed toward the breath. Relax and Renew, Judith Lasater, PhD, PT http://www.rodmellpress.com/relax.html. This is a wonderful book on restorative yoga. Lets take that a little deeper. In both of my last two intensive four-day trainings with YogaFit® on Restorative Yoga and Yoga Therapy, Yoga Nidra was discussed and we were able to experience a couple of Yoga Nidra sessions. Richard Miller, PhD, aptly explains that reading about Yoga Nidra is a bit like reading a description of sugar before youve ever tasted such a treat. ~ Yoga Nidra, The Meditative Heart of Yoga, by Richard Miller, PhD. So if you like what youre reading here, youre going to love actually experiencing a Yoga Nidra! Dr. Miller equates Yoga Nidra to that timeframe between sleep and awake where we wake up naturally in a state of profound relaxation. We can all access this deep state any time of day by taking the time for Yoga Nidra. It induces a profound relaxation in the body and mind, eliminates stress, overcomes insomnia, solves personal and interpersonal problems, resolves trauma and neutralizes and overcomes anxiety, fear, anger, and depression. While this is not hypnosis, it has similarities in that while you are in a profound state of receptive relaxation, you remain totally aware and alert throughout the process. The actual length of a Yoga Nidra can be longer than this onethe ones I experienced were 30-40 minutes of glorious relaxation. Yoga Nidra can be performed in a matter of seconds, a few minutes, or it can be an in-depth practice lasting an hour or more. Julie Lusk also has a wonderful newsletter with excellent ways to relax during your day as well as has her own Yoga Nidra CD, Real Relaxation, which I highlight in this newsletters featured CD: http://www.wholesomeresources.com/buy_shop_books_CD.htm. Restorative Yoga, Yoga Nidra, and Hyp-Yoga during final relaxation (see the pose featured this month) provide wonderful ways to use the power of Yoga to enhance your well-being and promote relaxation and stress-relief. I plan to incorporate more of these practices into my yoga classes and offerings! If you found the above interesting, please consider taking my meditation how to classes. Visit my Web-site, www.betterdayyoga.com, for details. If you are familiar with chakras, then you can tell from my logo that I love chakras. The rainbow-colored spheres within my logo are representative of the chakra system within the body. If you are unfamiliar, here’s a quick lesson: There are seven energy centers called chakras (literally “wheels”) that store energy/life force/prana. They are along the spinal column and correlate to major nerve ganglia branching forth from the spinal column. Each has a different relationship to a gland in the body’s endocrine system. Each stimulates different organs and systems in the body. Hatha Yoga activates these energy centers releasing the energy that flows through the spine. Yoga helps these energy centers/nerve bundles to function correctly clearing blocks that may be there. Each chakra also is associated with a mental/emotional focus. In each newsletter I’ll highlight how you can work with a particular chakra to correspond with the season. Working with the brow chakra opens the mind to the divine and the spiritual—sounds like a magic portal to me, doesn’t it to you? Since magic portals have been the theme for this newsletter, the third eye chakra is where it’s at! Final relaxation / Savasana and yoga nidra were both indicated as being good times to introduce positive affirmations and guided visualizations to introduce healthy changes and attitudes into your life. As you work on balancing the brow chakra, your ability to change the way you view your life and your purpose are strengthened as well. So there’s a great place to start work on your third eye chakra! Create an affirmation! Speaking of magical portals—if I could share with you a magical time to create and write your affirmations to give them more energy, would you be “in”? I knew you would be! Write them during the new moon each month. (http://www.timeanddate.com/calendar/moonphases.html) Now don’t roll your eyes here! Your agriculturally minded ancestors have planted during the new moon for “many moons”—pun intended! They have come to know this as a time for new beginnings, so get on board! This book gives a whole new meaning to the phrase “moontime”! “The Moon’s influence on human destiny has been recognized since ancient times, but its potential for generating positive outcomes has often been ignored – until now. In this breakthrough book, astrologer Jan Spiller reveals the secrets of harnessing the Moon’s astonishing power to make your goals a reality! Not just another astrology book, New Moon Astrology provides practical, step-by-step instructions, based on ancient rites and philosophy as well as Jan Spiller’s own vast astrological experience, in framing your wishes in any area- love, career, family, or health. This chakra is considered the chakra of intuition—your third eye. Do you feel intuitive? If not, why not? Similar to being open to the magic so that it feels welcome, you need to feel open to your intuition for it to develop within. We are all intuitive! But like the proverbial child’s gift—some assembly is required! Namely—accepting your intuition. Know that you know what you know. This chakra is about distilling the wisdom you’ve acquired and accepting it. My opening section on magical portals referenced the influence of fairy tales to promote magical moments—and intelligence (remember the quote from Einstein!). The third chakra is stimulated by letting your imagination soar. So “Read fairy tales and mythology, try to visualize crazy things, or, better yet, write a short story of your own. Everything that promotes your fantasy life also awakens your forehead chakra.” A Handbook of Chakra Healing, Spiritual Practice for Health, Harmony and Inner Peace by Kalashatra Govinda. Again, time alone spent in yoga nidra, meditation, and—of course, yoga—will foster a healthy environment for your intuition to flourish. I can only tell you from experience that when I have been following a regimen of consistent meditative time, my intuition doesn’t hesitate to make its presence known! We are all intuitive, regardless—but why not help things along by destressing, relaxing, and adding meditative moments? I have to share an example here. A few months ago as I was working on one of my newsletters, I was looking for one of my stray reference books to quote. As is the case many times, I couldn’t remember where I’d last placed the book. I scoured my yoga bookshelves to no avail—yes I have specific shelves for my prized possessions—there’s shelves in another room for health & nutrition, intuition, self-help, Reiki….need I go on? Today I was in a bit of a hurry and getting frustrated, so I sent out a request to the Universe to please let me find it sooner rather than later. Suddenly as I was stooped down looking, a flash came across my mind that it was next to our Amish rocking chair by the fireplace, on the floor, in the pile that inevitably forms there. I kid you not! Guess where I found it? Too cool! You may think that I simply “remembered” it, but trust me—this was after several attempts to “remember” and directly after my sending out the request. This “request technique” works the best for me when I’ve been meditating regularly. It’s one of the awesome side benefits of meditating—you make friends with your third eye chakra! Unfortunately, in today’s day and age, we barely take the time to read a full sentence, let alone take time to be still for any length. Note to self—wouldn’t you like to make an ally of your third-eye chakra, with your intuition? Sudden and sometimes profound insights and moments of inspiration should be the norm, not the anomaly. Your intuition is like a muscle—if you don’t use it, you’ll lose it! I had recommended a “coincidence journal” in the opening section for ways to show recognition of your magical moments, thus inviting more of them to make themselves known. Recognition of these moments invariably makes them multiply! The same goes for your intuition. You may be relegating your intuitive moments to “coincidence”. When you start writing them down, you’ll realize how consistent they can be with a little attention. http://stress.about.com/od/journaling/a/coincidence.htm. Another suggestion would be to keep a dream journal. Write down your dreams just after waking up. My regular readers know I’ve referenced the “magical time” between sleep and awake often! This is how I came to name my business “Better Day Yoga”. Similar to the coincidence journal, and my advice to start noticing your magical moments, the more you ponder your dreams, the more clear and intense they become. Place your middle finger at the bridge of the nose and push up a couple of inches, breathing deeply and imagining that you are opening the eye lid. Light moves up, from your root chakra, through the second, third, fourth, and fifth chakras, and if you are open, it bends at the sixth chakra and shoots straight out of your third eye. Some people experience it literally as a light or a laser beam. Others experience it more as a feeling. Even if you simply pretend to sense this light, imagine it moving up your spine from the root chakra to your sixth chakra (the third-eye chakra), and feel the light bend and shoot out like a laser from your third eye. I’m excited to find this exercise as I’ve been doing her “Hook-Up” exercise as part of my “daily energy routine”, and it involves a similar move with the third eye. The sensation I feel with the “Hook-up” is more explained by the sensation she describes above. Cool! 1. The Hook-Up creates a connection between your central meridian (which sends energy up the front of your body) and the governing meridian (which sends energy up your spine), bridging the energies between the front and back of your body and between your head and torso. 2. It strengthens your aura. 3. It increases your coordination. The Hook-Up is one of the most powerful tools I know for quickly centering myself. It has immediate neurological consequences. Several of my students have reported using it with someone who has started to seizure and seen the seizure stop within 15 to 20 seconds. 1. Place the middle finger of one hand on your third eye (between your eye-brows above the bridge of your nose). 2. Place the middle finger of the other hand on your navel. See the breathwork and visualization below for another experiment she suggests to work with your third eye chakra. This is an awesome lady! The third eye chakra vibrates to the color indigo. Indigo is one of my absolute favorite colors. The indigo pigment was derived from two of my favorite crystals—azurite and lapis lazuli. Indigo elevates your awareness to the spiritual—think midnight sky. “Contemplation and deep meditation come easier in the indigo depths of night. Night-time is often when inspirations and solutions to problems naturally arise.” ~ Healing with crystals and chakra energies, by Sue and Simon Lilly. Meditation helps develop your third-eye chakra—try meditation under the stars! I talked about thinking outside the norm to allow for the possibility of magic in my opening section on magical portals. Indigo facilitates that movement from normal to magical. “Those using a lot of indigo energy are able to step away from how the world is usually seen and come up with new and startling ways of thinking.” ~ Healing with crystals and chakra energies, by Sue and Simon Lilly. Perhaps the use of indigo energy is where the phrase “out of the blue” comes from—kind of like my flash of intuitive insight for finding the book earlier. So another way to stimulate the third-eye / brow chakra is to use put indigo in your life. Indigo will help you “develop sensitivity to the inner senses and intuition”. ~ Healing with crystals and chakra energies, by Sue and Simon Lilly. My musings on the third eye chakra got me to thinking about magical night skies, “blue (indigo)”, and “moon (writing affirmations during the new moon)” which led me to wonder about the phrase “once in a blue moon”. “Modern interpretation of the term relates to absurdities and impossibilities; the phrase “once in a blue moon” refers to an event that will take place only at incredibly rare occasions”. http://en.wikipedia.org/wiki/Blue_moon. It is considered an “especially magic time”. We’ve spent this newsletter immersed in the impossible becoming possible—magical portals. Use your third eye chakra to manifest magical moments that become your “norm” and multiply your “once in a blue moon” moments exponentially! I am wise, intuitive, and aligned with my highest good. I am the source of truth and love in my life. Sources: The Chakra Energy Plan, The practical 7-step program to balance and revitalize, by Anna Selby. The Book of Chakras, Discover the Hidden Forces Within You, by Ambika Wauters. Dark bluish colored fruits: blueberries, red grapes, black berries, raspberries, etc. Aromatherapy and the Brow / Third Eye Chakra: One of my favorite all time scents is a good one to stimulate this chakra—rose geranium! Others include: violet, lemongrass, sandalwood, cedarwood, and cajeput among others. “3 Wise Men” is a Young Living Essential Oil™ that also works to open the third eye. If aromatherapy interests you, I use Young Living Essential Oils™ which are therapeutic, food-grade oils. Please inquire if you are interested in purchasing a favorite scent and I can add your request to my personal monthly order. Essential oils raise the vibrational frequency of the body. When the vibrational frequency of the body drops, we become more receptive to ill health: http://justalist.blogspot.com/2008/03/vibrational-frequency-list.html. Therapeutic-grade essential oils are great to have in your arsenal of health promoting natural products. Gem therapy and the Brow / Third Eye Chakra: Gemstones amplify the energy when placed in contact with your chakras. For those of you unsure on this subject, consider that it’s scientifically proven that everything is energy. Nothing is really solid. Why wouldn’t the energy of a stone work effectively with the energy in our bodies just as some research speculates that the energy of computers, cell phones, and microwaves may affect our bodies? At the very least, I find that holding a favorite stone is like a talisman for me, or a “worry stone”. As my favorite author, Wayne Dyer, likes to say, “If it’s a placebo effect, I’ll take two”. Some Brow / Third Eye Chakra gems are: Blue Sapphire—my birthstone—azurite, lapis lazuli, sodalite, kyanite, opal, amethyst, and blue tourmaline, among others. Listen to your inner voice when making your purchase! Placing your gemstones directly in the center of your forehead is a great way to heal this chakra. If gem therapy interests you, you can find a great selection at www.crystallinelight.com or you can also link to her Web site from my links page at www.betterdayyoga.com. I’ve known Jennifer, the owner, for many years and love her products (and her)! Yoga poses for the Brow / Third Eye Chakra: All yoga poses essentially activate the chakras. Some yoga poses to stimulate the third eye chakra include: If headstand is in your practice, this yoga pose stimulates the third eye chakra. You could also try half headstand. Yoga asanas and breathwork are practices to aid you in developing a meditation practice—which, as mentioned many times, stimulates the third chakra! Stilling the body enables you to journey to your inner magical realm. Mudra means seal in Sanskrit. Its a symbolic or ritual gesture using primarily the hands. Each position is believed to have a specific effect. Specific positions can lead to specific states of consciousness symbolized by the hand positions. For example, if a person frequently and with feeling does a position of fearlessness, they will also be freed from fearfulness in time. Mudras are said to engage areas of the brain and/or soul influencing them, sometimes physically, by their usenot unlike an affirmation, or reflexology for that matter. Think of these gestures as self-talk for your hands. These simple movements, the gestures that we often make unconsciously, can help us focus on our work, calm ourselves, release anger and energize us. Used for centuries by many different cultures, mudras are seen in Eastern dance and meditation, in ancient Egyptian friezes, even in Byzantine icons of Christ. Most of us use them today, too: we wave goodbye, we press a hand to our chest in distress, we wriggle our fingers to release energy, or press fingertips together to calm ourselves. Easy to learn, mudras can be done anywhere, at any time: at traffic lights, in meetings, in airplanes, when were arguing, when were grieving, when we need to prepare for sleep. The word mudra can be translated from the Sanskrit as that which brings inner peace, and that s what mudras are: a physical means of quieting our bodies. Product description for Mudras: Ancient Gestures to Ease Modern Stress by Emily Fuller Williams. This newsletter has been all about magical portals and finding our own inner magical realm. This mudra reminds us that cosmic consciousness in all its forms manifests itself in everything and everyone around us, that we are connected with everything through our individual consciousness. ~ Mudras, Yoga in Your Hands, by Gertrud Hirschi. To me, cosmic consciousness is being conscious of the magic. If it manifests all around us and we are connected to it, then we are never far from connecting to our inner magical realmour magic portal. We are all oneeven if we dont acknowledge the magical realm yet. Connecting to the cosmic consciousness, we are guided through our intuition, our third eye chakra highlighted earlier, and we are supported. When we share our insightsour intuitionwe are calling witnesses to our inner magic. Point the left hand down to the earth and let your fingers touch the ground. Let your right hand point upward to Heaven, like an open flower. Bhumisparsha means touching the earth and helps to calm the mind. I often use the phrase connecting heaven to earth when cueing a pose. I think yoga is vital to keeping us connected to both. We are the conduit in the middle. This mudra exemplifies that to me. The left hand, our yin or feminine-side hand, connects to the earthour mother. The right hand, our yang or masculine-side hand, connects to the skyour father. Connecting heaven to earth, we are guided, protected, supported, and upheld on our path in life as the affirmation so beautifully reminds us below. Affirmation: Connected with cosmic consciousness, I feel myself guided, protected, supported, and upheld on my path in life. Scientific studies have shown that real relaxation and yoga nidra helps with a variety of physical and mental problems. Scientific studies have shown that real relaxation and yoga nidra helps with a variety of physical and mental problems. It can boost your immune system, lower blood pressure, and decrease pain. Here you’ll find some answers to frequently asked questions about Yoga Nidra compliments of Julie Lusk’s PDF referenced below. Yoga Nidra is a powerful technique that yoga sages have been using for thousands of years. Yoga Nidra means “yogic sleep.” Yoga Nidra refers to a state of consciousness and not to a particular technique. It’s a state of conscious deep sleep that goes far beyond deep relaxation to a place of intrinsic peace and quiet. It’s a glorious place where awareness remains yet the thinking mind withdraws. What’s experienced is awareness without words, thoughts, images, feelings and other sensations. It’s where our innate wisdom, intelligence and intuition naturally reside. Is Yoga Nidra different from meditation and hypnosis? Yes. In meditation, we stay awake and notice, observe and remain undisturbed when thoughts, words, feelings, beliefs, and images appear and disappear. In hypnosis, we’re in a brain wave state that is not as deep as in yoga nidra. With hypnosis, someone else makes suggestions to us in this altered state. In Yoga Nidra, positive suggestions originate and come from within ourselves for lasting and constructive change. This is called setting a resolve, or sankalpa. With regular practice, your health will undoubtedly improve. Scientific studies have shown that real relaxation and yoga nidra helps with a variety of physical and mental problems. It can boost your immune system, lower blood pressure, and decrease pain. Though it’s not a substitute for sleeping, one hour of yoga nidra equals about 4 hours of typical sleep because the brain wave state we’re in is extremely restful and relaxing. You’ll enjoy living with a clear head. Eventually, mood swings and emotional upsets won’t bother you. Your creativity and intuition will flourish in a positive and productive way. Plus, your energy increases. How is Yoga Nidra Done? One of my dearest friends cooks, bakes, and grills like a professional chef. She loves to chop vegetables, says things like “ramekins” and has her own tablecloth named after her—The Christine—for purchase at The Palate in Stockholm, WI: http://www.thepalate.net/. Preparing food has been her passion since before my husband and I met Christine and her husband, Mark, over 15 years ago. It has been our good fortune to be the lucky recipients of many delicious meals and absolutely wonderful times in their home. Since I am all about following our passion, this is my way of letting her have an outlet for hers. Enjoy! I have to say when Christine sent this recipe to me, it brought a tear to my eye. I haven’t had my mom’s cabbage rolls—better known to Poles as gołąbki (gaw-WOHMP-kee)—since she passed away close to 25 years ago. This newsletter is all about magical portals. I’m fairly certain that every mom puts a little magic in their special recipes. I know my mom did. My friend, Christine, has the magic touch in everything she makes—and THAT is the voice of experience talking! Enjoy! “The old saying, “everyone is Irish on St. Patrick’s Day”, is definitely true when it comes to enjoying St. Patrick’s Day foods. And the foods most associated with this celebration – cabbage, potatoes and root vegetables, are packed with powerful nutrients. Cabbage, for one, is not only chock-full of anti-cancer fighting chemicals and antioxidants, but can lower cholesterol and promote good bacteria in the digestive tract. Top that off with a healthy dose of vitamin C and K and you have one powerful “ball” of nutrition. There are over 400 varieties of cabbage, but the most often seen are Napa, Red, Savoy and Common (green). The colors can range from deep green to a deep reddish purple. The deeper the color, the greater the nutritional value. In Ireland cabbage is considered good luck because it is green and resembles money. Eat Cabbage for luck and nutrition. They are a sign of good luck at New Year—so why not St Patrick’s Day too! Here is a recipe that will bring a pot of gold at the end of your rainbow. Remove the damaged outer leaves from the cabbage. Separate the leaves from the cabbage. Rinse then put in a shallow pan of simmering water to steam the cabbage leaves. They should steam for 5 to 10 minutes so that they are pliable enough to roll around the filling. Check the pan every few minutes and remove the leaves as they are done. The larger outer leaves will take less time to steam then the inner leaves. Place the steamed leaves in a colander to drain and cool so they are easier to work with. Sauté the onion in 2 tbsp of garlic oil over medium heat until translucent, about 5 minutes. Add the garlic and sauté 2 minutes more. Take off the heat and allow to cool for 5 minutes. In a large bowl combine the rice and ground meat. Add the sautéed onions and garlic and the beaten egg. Mix the tomato soup and canned tomatoes in a medium size bowl until well blended. Cover the bottom of a casserole dish with a thin layer of the sauce. Place a spoonful of the filling in a cabbage leaf. Roll the leaf around the filling and place the roll seam side down in the casserole dish. Continue until filling is used up. Pour the remaining sauce over the cabbage rolls. Place in a 350 degree oven and cook for 50 to 60 minutes. Remove from the oven and keep covered for 10 minutes.Serve warm. This month I suggested using Final Relaxation / Savasana as your magic portalopening to the magic available to you when you find deep relaxation. In the Meditation On The Go section, I highlighted Yoga Nidra / Yogic Sleep as a way to take Savasana further and I mentioned Julie Lusks Yoga Nidra CD, Real Relaxation, highlighted here. In the “Healthy News” section you’ll find some answers to frequently asked questions about Yoga Nidra compliments of Julie Lusk’s PDF referenced there, along with a link to the full PDF. I have used many of Julie Lusks resources! I have been teaching for four years. In all that time, the one final relaxation meditation that has consistently been remembered and re-requested by many of my students as their all time favorite meditation is Julie Lusks The Pond of Love from her Yoga Meditations book as well as from her 30 Scripts for Relaxation, Imagery & Inner Healing – Vol. 2. I’ve had more than one student comment that they “go back there often” in their minds. Your body needs this type of relaxation! Practice yoga nidra often! This CD takes you into a deeply relaxing and powerful state of being fully aware while being in the state of deep sleep. About the author: Julie has dedicated her efforts to helping others attain stress relief, wellness and holistic health through yoga, meditation and guided imagery. Julie has a Masters in Education from Virginia Tech. She is a National Certified Counselor and Registered/Certified Yoga Teacher. Julie was a Licensed Professional Counselor in Virginia for 20 years. Julie has taught yoga since 1977 and is certified to teach a variety of styles ranging from gentle to vigorous yoga. Yoga Alliance awarded her the highest credential available. She teaches locally, nationally and is a teacher trainer. Her previous careers include Regional Director, Mercy Holistic Health and Wellness Centers (Cincinnati, OH), Assistant Dean of Students of Roanoke College (Salem, VA) and Director of Health Management, Lewis-Gale Clinic (Salem, VA). Julies volunteer efforts in community health promotion earned recognition from the US Surgeon General and the Governor of Virginia. At Vita Bella we offer a holistic approach to revitalize your whole being by addressing the mind, body, emotional and spiritual self. Services include: aromatherapy, brain gym, emotional release, yoga, meditation/breathwork classes, and facial exercise classes. Vita Bella Health & Wellness is expanding! Do you need a home base to provide your holistic health service to the community? Do you have a passion for health & wellness? Vita Bella Health & Wellness Center offers beautifully decorated, fully furnished common areas, ample free parking, easy on/easy off highway access in a quiet, Little Canada neighborhood. Ideal for acupuncturist, ayurvedic practitioner, chiropractor, massage therapist, etc. Come meet your future colleagues and start or expand your holistic health career today! Serious inquiries only, please contact Sandy at 612 708 6900 or Kari at 763-785-4600. Rent starting at $250/month. “When was the last time you had a conversation with the moon? Or made a wish on a falling star? Held hope from a string of delicate things. When was the last time you got lost in an enchanted wood?..The time is now.” ~ A Knock at the door by Angi Sullins and Silas Toball of Duirwaigh, Inc.